Nintendo Switch: If you have fond memories of grabbing your GameCube and all of the chunky game cartridges that were paired with it, you’ll love this updated gaming system. Play newer games or the old classics on this portable handheld system and you’ll never have to worry about lost games and tangled cords. 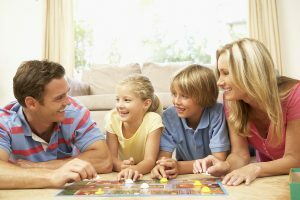 Updated board games: Many board games like Monopoly, The Game of Life, and Scrabble still contain the same rules and setup, but with new electronic updates. For instance, Scrabble now comes with an electronic system for counting points on letters, making gameplay faster and easier for players to keep track of their scores. Monopoly has an updated version with an electronic banking system, making money-handling easy for both players and the parents keeping track of game pieces! Phone versions of games: You probably know about Candy Crush and Flappy Bird, but did you know you can play your favorite arcade games on your phone? Arcades may be hard to come by, and you may feel a little out of place in one now. Thankfully, you can play games like Pinball, PAC-MAN, Frogger and more, without ever having to set foot on a sticky arcade floor. Many of these games are free and allow you to compete with other high scores, making for some friendly, fun competition!